Last January, animal lovers the world over were shocked to learn that over 400 dolphin carcasses had washed ashore in Peru. There was extensive news coverage, mainly because this was reminiscent of another massive die-off a couple of years ago. In 2012, eventually, amidst somewhat questionable situations, it seems to have been declared that the die off was due to natural reasons and there were no malicious issues at play. At that time, the culprit was believed to be explosions and other activities related to oil exploration in that area. However, the official report exonerated all such activities. 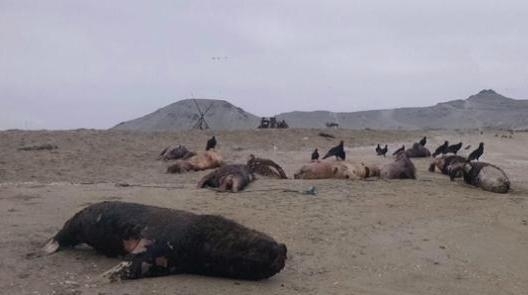 The Peruvian authorities have removed the sea lion carcasses from the beach and should institute an investigation into exploring the reasons for such massive deaths. Infectious agents, mainly viral, have been implicated in at least one such major die-off. Morbilivirus, a member of the Paramyxoviridae group, causes a disease akin to the measles virus in man. Unfortunately for the dolphins, it is deadly. There are secular cycles which seem to occur at intervals of several decades where the waning immunity of the dolphins renders them vulnerable to such an epidemic leading to massive deaths. The exact epidemiology of the virus is poorly understood, and since there is waning immunity across generations, it may be assumed that the virus does not remain in continuous circulation either. There must be some localised “source” which spouts the virus every few decades, claiming the lives of the animals that are unable to mount an immune response, while providing the survivors with lifelong immunity. I am, of course, using my human immunology knowledge when I say this: I have no clue if there are any other factors at play in dolphin diseases! However, coming back to the sea lion die off in Peru, this is bad news ecologically speaking. Understanding what is causing such mass casualties could help us in preventing them. And although right now it is believed that there is no risk to man from the viruses that cause such lethal epidemics in cetaceans and sea lions, one never knows when the virus will make a zoonotic jump across species. 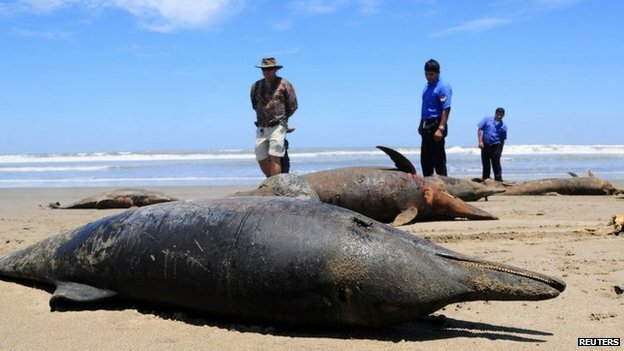 What has made the current sea lion die off more sinister is an immediate spate of deaths further north up the coasts, in a place called Piura, where carcasses of over 200 dolphins, turtles, sea lions and pelicans washed ashore. The official investigations into those deaths are still on and we already have another lethal die off on our hands. The thing with wildlife diseases is that it is very difficult to predict and prevent. Even if we do uncover the causative agent behind the massive die offs of so many glorious animals, it will not be a very helpful stride. We do not have the means to vaccinate them or create preventive barriers for these animals, unless and until the epidemiology of the agent is understood threadbare; and considering that we still are unaware of what is causing these die offs, I would say such systems are still some distance off into the future. As a student of epidemiology and infectious diseases, this fascinates me. As a traveler and animal lover, this pains me. One can only wait for the official reports to shed more light on these mysterious deaths in the foreseeable future and hopefully, we can mount methods to counter them, and prevent such grave losses in the future. Tags: animal deaths, dolphin, infections, paramyxovirus, Peru, sea lion, viral, viral diseases, virus, zoonoses, zoonotic diseases. Bookmark the permalink.